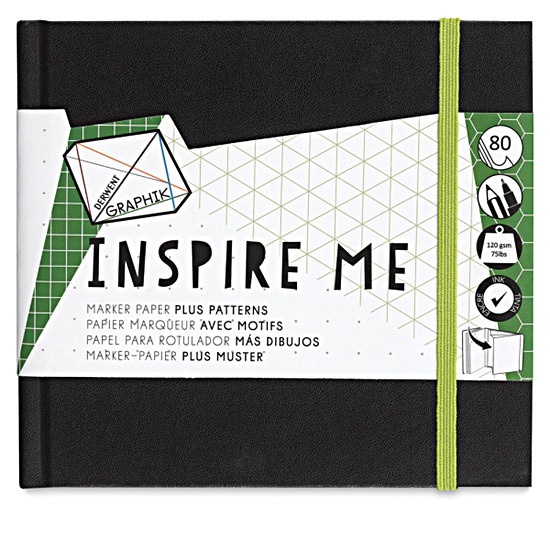 Derwent Graphic INSPIRE ME Marker Sketchbooks contain 80 pages of bleed-proof paper which includes lightly printed patterns to inspire your imagination. Sketchbooks have 80 pages - 48 blank plus 32 pages with lightly printed dots, triangles, squares and hexagons (8 pages of each). Sheets are micro-perforated on inner edge for easy removal from the fabric-covered hard-bound covers. Sketchbooks include an elastic band closure and inside pocket. Paper is 75 pound weight. 80 sheets of bleed-proof paper. 48 pages lightly patterned to help your imagination. Pages are 5-1/2" sq. hardbound.